April 20th, 2019 - Congrats to Al Weber and Gusto von der Rennbahn for going High in Trial at the NEK9 Fall trial. He also was High IGP 3, High Tracking, and High Protection. Al and Gus also earned a qualifying score for the 2019 USCA GSD National Championship! September 23-27, 2015 - Congrats to ​Laurie Coppola and Dasko von der Rennbahn​​ for being selected as the 6th spot on the 2015 WUSV World Championship held in Lahti, Finland! August 29th, 2015 - Congrats to Al Weber and Fena du Chenil Victoire on earning their FH with a score of 90 points unber USCA Judge Nikki Banfield. June 7th, 2015 - Congratulations to Al Weber and Fena du Chenil Victoire, IPO3, for earning their second IPO3 title at the Liberty Working Dog Club trial, with scores of: 80-81-83-244. May 10th, 2015 - Congrats to Laurie Coppola and Dasko von der Rennbahn, IPO3, FH on their 8th place finish at the 2015 Working Dog National Championship in Buffalo, NY with scores of 91-88-93-272. Dasko also qualified to represent USCA at this years WORLD TEAM Qualifier. May 9th, 2015 - Congrats to Sierra Seerup and Archer du Grauen Wolf Haus, IPO 3, AD on earning their OB3 at the 2015 Working Dog National Championship in Buffalo, NY. Kevin Girvn and Enzo von der Rennbahn on earning their IPO 2 and going high IPO 2! Al Weber and Fena du Chenil Victoire on earning their AD and their IPO 3, and going High Protection!! Laurie Coppola and Falco von der Rennbahn on earning their IPO 3 and going: High Tracking, High Obedience, High IPO 3 and High in Trial! November 23rd, 2014 - Congrats to Sierra Seerup and Archer du Grauen Wolf Haus on achieving their IPO 3 today under GSSCC Judge Jim Chrisp with scores of 96-80-94-270. This is Sierra's first IPO3 dog and Archer is not even 2 years old yet! WAY TO GO Archer and Sierra! October 12th, 2014 - Congrats to the following Northeast K9 Club Members who attained titles this weekend!! NICE JOB!! October 5th, 2014 - CONGRATS to Chris Banke and Iriac von der Maineiche on representing the USA at the 2014 RSV World Championship 92-74-87-253!! ﻿September 14th, 2014 - Congrats to the following club member who competed successfully at the 2014 New England Regional Championship!! Laurie Coppola and Falco von der Rennbahn on earning their IPO 1 with scores of 100-87-86-273 and also earning High Tracking, High IPO1, and High in Trial! Laurie Coppola and Ena von der Rennbahn IPO3, FH, for earning another IPO3 with scores of 97-87-87-271, going High IPO 3, and earning a qualifying score for the 2014 USCA GSD National Championship. May 31st, 2014 - Congrats to Laurie Coppola and her dog Dasko von der Rennbahn IPO 3, FH, who earned a spot at the 2014 Combined WUSV Qualification trial held on May 31st, in Fayetteville, AR. May 11th, 2014 - Congrats to Laurie Coppola and Ena for their successful IPO3, showing at the WDC National Championship in Grove City, OH. Also congrats to Laurie and her dog ﻿Dasko von der Rennbahn,﻿ who earned a spot at the ﻿2014 Combined WUSV Qualification trial﻿ to be held on May 31st, in Fayetteville, AR. NEK9 would also like to congratulate Adriel Linyear who is now a USCA Regional Level Trial Helper! We hope to see him at the national events sometime soon! As the President and Training Director of Northeast K9, I'm excited to share the success of our club members and their dogs. 2013 was the first FULL year that we have been a full USCA member club. In this year ALONE, we, as a TEAM, have put more than 30 titles on our club dogs. Except for 2 of our club dogs, all of these titles were earned by dogs 3 years old and under. We have represented at EVERY (USCA and AWDF) National Championship this year and we have even had a club member compete at this years FCI and WUSV Word Championship representing Team Canada. I couldn't be more proud of my club, and my team members!! You guys ROCK! November 9th, 2013 - Congratulations to Al Weber with Fena du Chenil Victoire, and Chris Williams with Grant vom Himmelhoch, on earning their IPO1's today under USCA Judge Frank Phillips. Chris and Grant also went High IPO1, High Tracking, High Obedience, High Protection, and High in Trial!! November 3rd, 2013 - Congratulations to Laurie Coppola and Dasko von der Rennbahn, IPO3, FH for their successful showing at this years 2013 USCA GSD National Championship in Merced, CA with scores of 92-87-92-271, and finishing 13th out of 43 dogs. Dasko is a 3 yo, BHOT dog! October 22nd, 2013 - Congratulations to Chris Banke and his dog Iriac von der Maineiche on traveling all the way to Germany and trialing for their IPO2!! They did an EXCELLENT job with scores of 96-91-90-277!! Chris and Iriac are also the first Americans to trial and title in the RSV2000. October 20th, 2013 - Congratulations to Frank McEniry and his dog Heck vom Haus TTH, IPO3 on their successful showing at the 2013 WUSV World Championship held on Philidelphia, PA., with scores of 85-77-86-248. We are very proud of you Frank and Heck!! 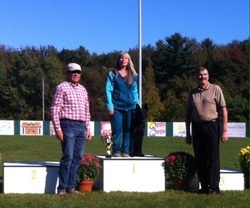 October 12th, 2013 - Congratulations to Mary O'Neill and her dog Declan Du Chenil Victoire on earning their IPO3, at the Quinebaug Schutzhund Club under SV Judge Bruno Kastelic-Sakoparnig, with scores of 91-72-84-247, and was High IPO3!! This is Mary's first time in the USCA IPO3 club!! CONGRATS MARY!! September 29th, 2013 - Congratulations to Laurie Coppola and Dasko von der Rennbahn, IPO3, FH on their 7th place finish at the 2013 New England Regional Championship with very good scores of 90-90-90-270. September 28th, 2013 - Congratulations to Chris Banke and Iriac von der Maineiche, IPO1 on earning their IPO1 under SV Judge Helmut Konig with excellent scores of 94-97-95- 286. Chris and Iriac were also High IPO1, High in Trial, and High Obedience. September 21st, 2013 - Congratulations to Club Member Frank McEniry and his dog Heck vom Haus TTH, IPO3 for his successful showing at the ***** FCI World Championship *****in the Czech Republic. Debra Perks and Brazen vom Oz Haus - IPO 1, earning High IPO 1, High Obedience, High Protection, and High in Trial!!! Laurie Coppola and Ena von der Rennbahn - IPO 3, earning High IPO 3, and at the age of 23 months is now IPO3, FH!! August 25th, 2013 - Congratulations to Laurie Coppola and Ena von der Rennbahn, IPO2, FH on earning their FH, at the Interstate Working Dog Club, under USCA Judge Nikki Banfield, at the tender age of 22 months. July 28th, 2013 - Congratulations to Frank McEniry and his dog Heck, on their 4th place finish at the 2013 GSSCC National Championship. Frank and Heck scored 90-87-93-270 and for the second year in a row, will be representing team Canada at the WUSV World Championship this October!!! WAY TO GO Frank! June 29th, 2013 - Congratulations to Laurie Coppola and Ena von der Rennbahn IPO 2 on earning their IPO2 at not quite 21 months of age, with scores of 94-87-83-264. Ena was high tracking dog and high IPO2 dog, at the Alpha K9 working Dog trial in New Egypt, NJ. June 29th, 2013 - Congratulations to Laurie Coppola and Dasko von der Rennbahn on earning their FH title today at the Alpha K9 working Dog trial in New Egypt, NJ, with a score of 92 points. He is now G Dasko von der Rennbahn, IPO3, FH! June 22nd, 2013 - Congratulations to Lesya Zaichenko and Dezzy vom Rebel Yelle on earning their IPO 1 today at the Quinebaug Schutzhund Club!! June 21st, 2013 - Congratulations to Deb Perks and Brazen vom Oz Haus on earning their AD at the Quniebaug Schutzhund Club!! Laurie Coppola and Dasko von der Rennbahn on earning a qualifying score for the IPO3, 2013 USCA National Championship with 97-84-92-273. Dasko was High IPO 3, High Tracking, High Obedience, High Protection, and High in Trail. May 25th, 2013 - Congratulations to Mary Kay O'Neill and her dog Declan du Chenil Victoire, on their IPO2 today under USCA Judge Ann Marie Chaffin, at the Liberty Working Dog Club Trial. Mary and Declan also took the honors of High IPO2, and High Protection!! May 19th, 2013 - Congratulations to Laurie Coppola and Dasko von der Rennbahn, IPO3 on their successful showing at the 2013 AWDF National Championship, in Lucas, KY.
April 27th, 2013 - Congratulations to Chris Banke and Iriac von der Maineiche, BH on earning their BH at the Maine Schutzhund Club, under GSSCC Judge Frank McEniry. April 6th, 2013 - Congratulations to Laurie Coppola and Ena von der Rennbahn for earning their BH today at the Upper Bucks Schutzhund Club, with USCA Judge Andrea Duggan. October 15th, 2012 - Congratulations to Frank McEniry and Heck on their successful showing at the 2012 WUSV World Championship!! WAY TO GO! We are VERY proud of you!! September 29th, 2012 - Congratulations to club member Laurie Coppola and her dog Dasko von der Rennbahn, IPO3 for her successful showing at the 2012 New England Regional Championship in Old Orchard beach, ME. May 13th, 2012 - Congratulations to Laurie Coppola and Dasko von der Rennbahn, IPO3 for their successful showing at the 2012 AWDF National Championship in Indianapolis, IN. 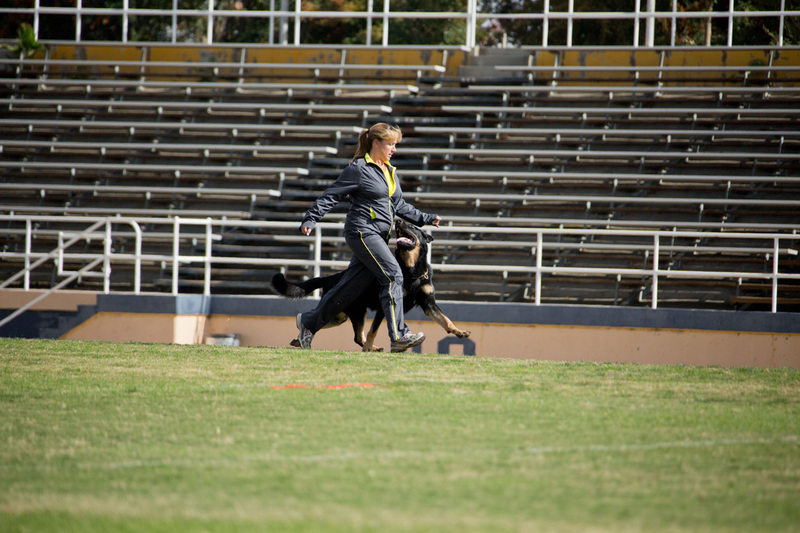 Laurie and Dasko were high scoring German Shepherd on the track with a V score of 99 points. April 23rd, 2012 - Congratulations to Laurie Coppola and Dasko von der Rennbahn, IPO3 for earning their IPO3 at just 28 months old at the 2012 Working Dog National Championship, in Grove City, Ohio. April 1st, 2012 - Thank you to Regional Director, Don Yelle for coming out and officiating at our affiliation trial! All of the handler/dog teams did wonderful!! Also thanks to all of our friends who came out to support and cheer the teams on :) We are now an official USCA club!! 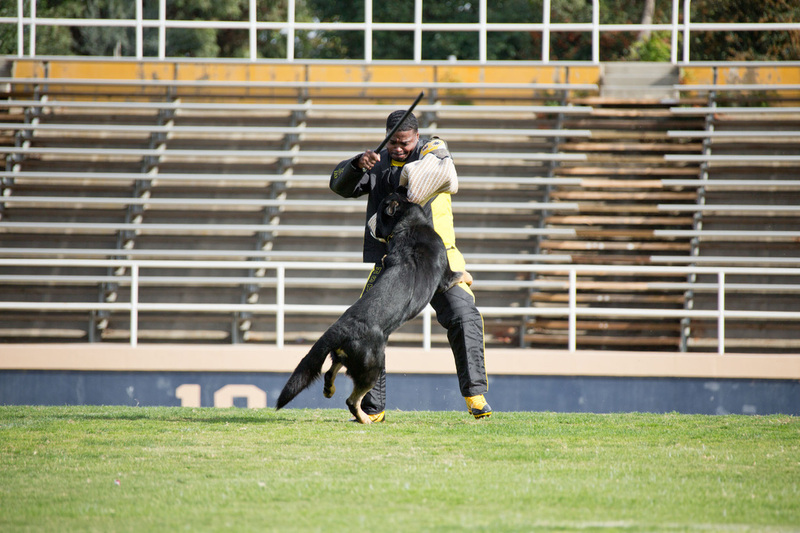 March 15th 2012 - Northeast K9 Sponsered a police training day at our training facility. We welcomed approximately 15 working police dogs from various departments including, NYS Troopers, Sheriffs, Schenectady PD, Rennselaer, Warren and Saratoga County. We had a fully day of detection (drug and bomb), patrol (protection) and tracking and we look forward to promoting the working Police K9 teams in our State. These men and women do an exceptional service to our communities and we are proud to play a small part in their training. We look forward to doing it again next month!! February 29th, 2012 - Congratulations to the members of NE K9!! We received notice from USCA that we are now an official affiliate club of USCA! November 6th, 2011 - Congratulations to Lesya Zaichenko and Dezzy for scoring first place in all three legs for UCD and Cash two firsts and a second for URO1. June 18-19, 2011 - Congratulations to Lesya Zaichenko and Dezzy for earning their BH and AD at Quinebaug Schutzhund Club under SV Judge Guenther Muellegger.